Seattle may receive 150 days of rain each year, but as insurance agents we know umbrellas aren’t just for wet weather. Umbrellas may be the most important part of your insurance protection plan. Umbrella insurance is a personal liability policy that protects you above and beyond the limits on your home, car, and other personal insurance policies. It’s an inexpensive way to protect your financial future. Policies typically cost $20 to $25 a month. I talk about the importance of umbrella policies with good reason. My younger sister, Jill, was involved in a near-fatal motorcycle accident eight years ago. Claudia sister, Jill, in the hospital after her near-fatal motorcycle accident. 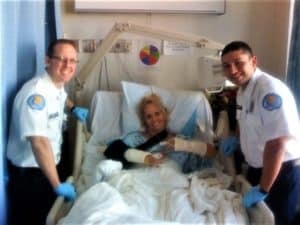 Jill was riding her motorcycle home from work when a car ran a red light and hit her. The impact broke her legs in multiple places, shattered her pelvis, and caused compound fractures in her arms. Jill spent nearly four months in the hospital undergoing multiple surgeries, and she still suffers from chronic pain. The accident changed her entire life. As her sister, I am deeply grateful for the medical technology—and Jill’s fighting spirit—that allowed her to survive this terrifying accident. As an insurance agent, I wish the driver who hit her had a personal umbrella policy. It would have compensated Jill for her medical bills, lost wages, and lifetime of pain and suffering. I will also never forget the time a client called to report a claim three days before Christmas. Our clients owned a single-family home they rented to a young family, and the tenants’ eight-month-old baby had been severely burned in the bath. The tenants claimed the home’s hot water heater was set at too high of a temperature which may have contributed to the infant’s injury. Thankfully, our clients had an umbrella policy to defend them and protect their assets. Claims like these are why, after more than 40 years in the insurance industry, I still recommend an umbrella insurance policy to every client. Have you ever thought about the incredible risks people take doing the most ordinary activities—driving near a school, hiring out yard work, or (as ridiculous as it sounds) even allowing trick-or-treaters on your doorstep? If something did go tragically wrong in any of these situations, you could be forced to pay a legal judgment not only from your current assets but from your future earnings, too. Money you haven’t even made yet. Sarah was meeting friends for dinner, but she couldn’t remember what time they were supposed to meet. She sent a quick text to check. With her eyes on her phone instead of the road, Sarah didn’t see the bicyclists in the crosswalk until it was too late. Both cyclists sustained serious injuries requiring hospitalization and rehabilitation. After Sarah’s auto liability limits were exhausted, she was held personally responsible for their medical bills. The Mariani family was in their front yard when their 81-year-old neighbor, Stewart, came to visit. The family’s gregarious golden retriever, Gus, ran to greet him. As Stewart bent down to say hello to Gus, the dog jumped up and knocked him over. Stewart fell backward, breaking his arm and hip and hitting his head on the sidewalk. Stewart was rushed to the hospital, where he ultimately succumbed to his injuries. The family’s personal umbrella covered Stewart’s medical expenses and ongoing litigation once their underlying home insurance was exhausted. Zach found leftover Fourth of July fireworks in the garage just in time for Halloween. When his parents were asleep, Zach and his friend snuck outside to give them a try. A bottle rocket zoomed off-course and landed underneath their neighbor’s car, catching it—and their neighbor’s home—on fire. Because of “vicarious parental liability,” Zack’s parents were on the hook for his actions, even though they didn’t know what he was up to. My husband tells me I worry too much. I admit it! I worry constantly that our clients have the protection they need. If you’d like to talk about protecting yourself with an umbrella insurance policy, please give us a call at (425) 379-9200 or click here. We are always here to help! Hi there! I'm Claudia, the president and founder of McClain Insurance. I started McClain Insurance in 1977 with a desire to serve others. We've grown dramatically since then, which has provided us the opportunity to give back to the greater Everett community. My husband, Pat, and I are blessed with two adult children and our granddaughter, Amelie. We love watching live theater performances, traveling, and watching high school crew races coached by our daughter, Caitlin. Thank you for the opportunity to serve your family! 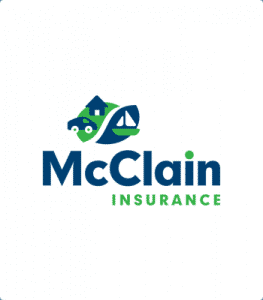 McClain Insurance Services is an independent insurance agency located in Everett, Washington. 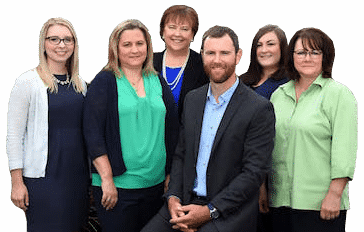 We are a Dave Ramsey Endorsed Local Provider for home and auto insurance and can handle all of your personal insurance needs. Call or email us today and we’ll be ready to help you however we can.